Moving Forward In A Healthy Way! Come Through Your Divorce Triumphant, Victorious and Unbeaten!! How To Not Only Survive Divorce, Conquer the Fear and Champion The Changes Ahead!! Contemplating Divorce? Join Elliette in the nitty-gritty of divorce......the legalities, the emotional toll processing, the financial impact and more! 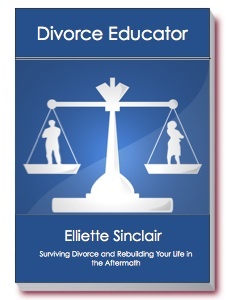 Not a lawyer, Elliette looks at divorce and the rebuilding process, through the eyes of a layperson’s eyes. Weigh all your options, choose all the members for your team using Elliette’s tried and true itemized checklists. In any divorce action, it’s not who you know.......it’s knowing who you need to know! M •• How Much Will A Divorce Cost? • • How Long Will A Divorce Take? • • Can I Avoid Divorce? • • How Do I Tell My Children and My Family? • • Do I Need A Lawyer? Or A Private Investigator? • How Do I Find A Lawyer? A Good Lawyer? A Private Investigator? If you have decided that divorce is in your future, don’t hesitate now!! Pre-planning may be the most important step in any successful divorce. Elliette includes a tried and true checklist for the items that you need to take care of while you are preparing for a divorce. Even before you choose a lawyer, there are items that you will need to gather...things like photocopies of bank statements etc. your self-esteem using Elliette’s suggestions and recommendations. computer - you will receive this book immediately! affiliate providers will do the secure credit card transaction. Click Here To Download the Divorce Educator Now!